South Korean technology major, Samsung is leaving no stone unturned to make the Galaxy Note9 launch a grand success. Read to know the key features of the Galaxy Note 8 successor. The much-awaited Samsung flagship Galaxy Note 9 is slated to make the global debut on August 9 in the New York City, but there have been very few clues on how the devices. For the past month or two, we have seen only cover case getting leaked. The images reveal where the fingerprint sensor and camera will be placed and there is much we don't know about it yet. Now, a promotional image has emerged online, leaving very little room for imagination on how the Galaxy Note 8 successor looks. World-renowned tipster Evan Blass (aka @evleaks) has shared of the official Galaxy Note9 poster, revealing the device language and also gives us a glimpse of Samsung's creativity with S Pen colouring pattern. In the picture, we see the gorgeous blue-hued Galaxy Note9 with a new design language. It confirms that the company has indeed moved the fingerprint sensor below the camera. This makes sense, as it will be easy to access. Also, consumers will less likely to touch the camera sensors, which was one of which was one of the major concerns in the Galaxy Note8, where it had a biometric sensor right beside the camera lens and many device owners touched it leaving sweaty smudges all over it. Now, this issue is unlikely to recur in the successor. And S Pen comes with gold-hued on the top-part and rest is painted bright yellow and it looks beautiful when paired with blue Galaxy Note9. It looks like Samsung has taken inspiration from South America's giant blue-and-yellow macaw. As far as the S Pen functionality is concerned, it will have Bluetooth modem of its own and will be able to control music tracks and volume, also several other capabilities, in addition, to note-taking features. The Galaxy Note8's Infinity Display design was one of the best-looking phones in 2017 and Samsung is said to improve on it with the Galaxy Note9, by trimming the top and bottom bezels to make the display panel wider, as you can see in the leaked image above. With such display, device owners are guaranteed of delightful viewing experience, be it watching high-resolution videos or playing graphic-heavy games. 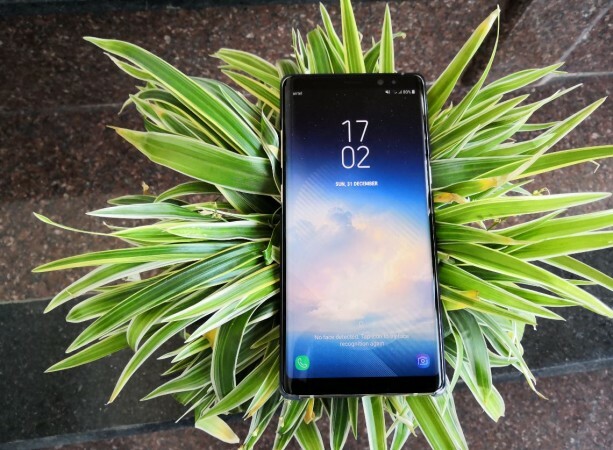 The new Samsung phablet is said to sport a slightly larger 6.4-inch Wide Quad High Definition (WQHD) screen with 18.5:9 aspect ratio and come with more than 85% screen-to-body ratio. The company has also enhanced the sunlight readability on device's super AMOLED display. Like previous years, the Galaxy Note9, depending on the region of sale, will be offered in two chipset variants. Devices-bound for US, China and South Korea-bound Galaxy Note9 will have Qualcomm Snapdragon 845 octa-core processor. On the other hand, Samsung phones headed towards India and Russia, among other global markets will house an Exynos 9820 octa-core processor. If the recently leaked benchmark scores are to be believed, both the Galaxy Note9 models will offer the same level of performance and would set a new benchmark in performance among Android phones. Samsung is also said to have improved ISOCELL technology for Galaxy Note9's camera, in addition to enhanced Optical Image Stabilisation (OIS) and variable aperture (F1.5-F2.4) to capture high-quality pictures in low-light. Another big improvement is that the company is upgrading the battery capacity to 4,000mah, 700mAh (21-per cent) more than its predecessor, which will be enough to last a one and half day under mixed usage. Rumours are rife that the Samsung, in addition to Galaxy Note9 base variant (6GB RAM and 128GB storage), plans to bring top-end mode with 8GB RAM+256GB and 8GB RAM+512GB models in select markets, but later in the year.